Do you know any women motorcycle riders? Well, how many do you know that are motorcycle-riding-Deacons? Meet Debbie! You’re a deacon at Broad Brook Congregational Church. Exactly what is a deacon? The word in itself means servant. To be a Deacon at BBCC requires a bit of time and dedication. The Deacons meet on a monthly basis and serve alongside the Pastor of the church. We are instrumental in leading our church in achieving it’s mission statement. We make decisions in regards to the spiritual business of the church. We are responsible for many things including and not limited to: the order of the Sunday services, offertory prayers as needed and requested, provide benevolence work, visit the homebound, we care for our church members and others in the community, help serve the Lord’s Supper, promote unity within the church. Tell us the story about how and why you became a deacon. My faith has lead me to become a Deacon. I have possessed a profound need to do what I am able for my family, friends, community, church and it’s members. I grew up in a small church and saw first hand how hard everyone worked to make a positive effect on all it’s members. I had excellent role models. The nurturing of a belief system and faith in a child is critical for that child to grow up, live by example as an adult and hope they will do the same for a church of their own someday. I have 3 brothers and 3 sisters in which I am the only child that grew up continuing to serve God. I have 3 children whom I have raised them with Christian values. Currently one of them is a mother now and raising her children in church. Time will tell for my other 2 children as their life unfolds before them. They have the foundation, let’s see where it takes them. For me, it was never a question of if I would become a Deacon but when. I have been a Deacon now for over 10 years and very proud of my service. Do people come to you for prayers and for help directly, or are they sent by the church? Sometimes they come to me directly, for those who know me, since not all are members of our church. They are looking for someone to hold their hand through a personal crisis. We as Deacons are bound by confidentiality, we never discuss anyone’s situations unless they request it. The church doesn’t send anyone to one particular person except for the Minister. There are times comforting words are better left to the Pastor. Women do ride motorcycles and you’re proof of that! How did you even develop the interest to ride and when did you start riding? I developed my interest in riding as a child. Our grandfather bought us a mini bike to ride off road. Several of the neighborhood children had them and we did have fun! My childhood home backed to woods with plenty of trails. I quit riding after I had my family, always hoping to ride again but figured as I got older would never happen. Just as we were about to become empty nesters, my husband bought himself a new Harley and then found me a safe riders’ course to get me back in the saddle, he didn’t like having passengers on the back of his! I’ve had my bike for 2 years now and have loved every minute of it. Just recently I went shopping for my daughter’s wedding and found myself strapping my wares I just bought on the back of the bike. It was November and absolutely too beautiful a day not to ride! Any excuse, no excuses! Have you ever ridden the “crotch rocket” style bikes? Are there things you prefer about the Harley style more? I have never ridden on a “crotch rocket”! I don’t care for that style bike. To each his own and my own is more in line with a traditional style bike with some of the features of a touring bike. I couldn’t live without saddle bags and a windshield. There are other luxuries I prefer as well but not to the extent of cruise control and radios! The point of the ride is less distraction and to be more in touch with your surroundings. When riding, you hear more, see more and smell more. 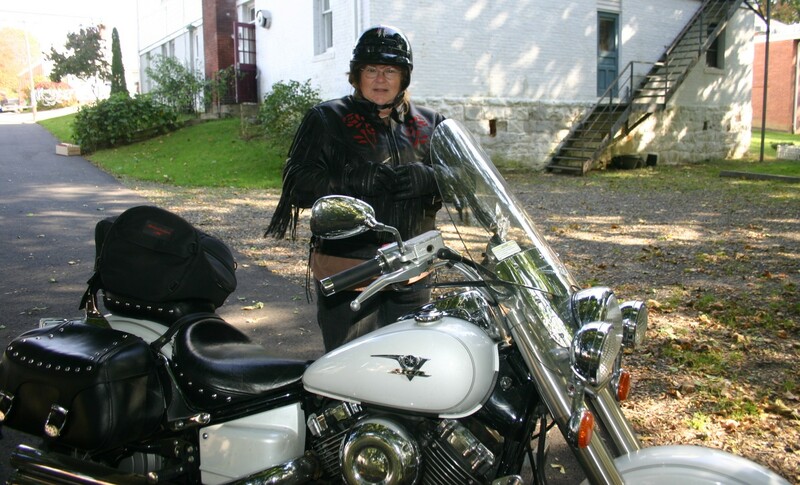 Do you always get looks from people who are amazed to see a woman riding? Once in a while I do get the look! But, there are plenty of women riders out there – more than you know. When the proper gear is worn, it can be difficult to tell the difference. It is quite common to see spouses riding separately too. The joys of back road riding is so rewarding, fun and unstressful. There are times my husband and I just get on our bikes with the intention to take a few moments for ourselves and several hours and a hundred or so miles later — oops! we just blew off our responsibilities but oh well! We had fun.